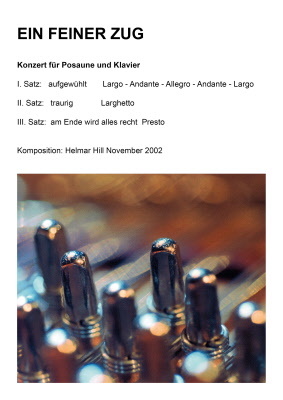 The first Helmar Hill composition presented on this CD, A New Job, originally was commissioned by Heavy Tuba. In that version Helmar played melodica rather than piano, so, he explains, “this is ‘a new job’ for me.” His melody is bright and lively, in many ways reminiscent of the tuneful movie themes from the 1960s and ’70s penned by the likes of Henry Mancini and Johnny Mandel. Helmar opens the track with a lush rubato chorus, and then Robert enters in tempo, stating the theme with a commanding presence. Robert, who commissioned this composition from Helmar in 2002 believes, quite rightly, that there are few, if any, comparable works in existence. And so, he predicts, “this concerto will excite the trombone world and will become part of the trombone repertoire.” Robert rises to the challenge of interpreting this boldly unique piece, and throughout Helmar is more than an accompanist – he is a true collaborator. The moody, minor-key ballad, Brasstime, the first of three Robert Bachner compositions on this disc, also appears, in a very different arrangement, of course, on Robert’s recent big band recording, Moments of Noise. With plunger in hand, he shows himself to be a master of communication, turning notes into words, and music into drama. Originally written by Robert for a sextet, and also recorded by his big band (in an arrangement by Helmar), One More Time has a slinky, cat-like theme. Helmar’s confident block chord-laced solo displays his innate rhythmic drive and sense of swing. You never for a moment miss the bass and drums. Helmar’s composition, Greetings from Kenny, was written originally for big band in 2000 as a dedication for the seventieth birthday of Canadian trumpeter Kenny Wheeler. In their solos Robert and Helmar are fittingly upbeat, displaying their common admiration and affection for this internationally respected jazz master. The closer, Robert’s original, Standard of Reference, is a lilting jazz waltz that he previously performed on his acclaimed 2006 quintet CD, Travelling Hard. As the great American jazz trombonist, Frank Rosolino, did so often, Robert uses a cup mute, capturing his idol’s deft phrasing and fluidity, but maintaining his own musical identity. Once again, he and Helmar engage in the type of insightful interplay and eloquent dialogue that characterizes this entire CD. It’s always exciting to be introduced to a major talent like Helmar Hill. Robert Bachner must be applauded for bringing the music of this exceptional composer-pianist to the wider world of jazz, as well as, of course, continuing to keep us aware of his own formidable playing and writing gifts.